What has been generally accepted for weeks is now official: Daniel Ricciardo will drive for Red Bull alongside Sebastian Vettel in 2014. The 24-year old Australian will take the place of Mark Webber, who leaves Formula One at the end of 2013 after a 12-year career including seven seasons at Red Bull. Ricciardo is the recipient of what is truly the chance of a lifetime. He will race alongside arguably the top current F1 driver at the current top F1 team. He will have the opportunity to win races and compete for the world championship. On the other side of the coin, he will have no valid excuses should he fail to perform. 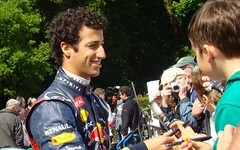 Ricciardo is the second product of the Toro Rosso team to be signed for Red Bull – Sebastian Vettel himself was the first. Toro Rosso exists partly as a training ground for Red Bull drivers, and so far the system has worked well, albeit briefly. Vettel won a race for Toro Rosso in 2008, to-date the only Toro Rosso victory, before replacing the retiring David Coulthard at Red Bull in 2009 and taking that team’s maiden victory at the 2009 Chinese Grand Prix. Daniel Ricciardo has not had the same level of success as Vettel did at Toro Rosso, but that is understandable considering that the team is not as competitive as it was back in 2008. Nonetheless, Ricciardo is highly rated and expected to excel in his new team next season.